Chain Reaction in Germany was implemented as professional development (PD) project. Starting each year by a PD course the Chain Reaction philosophy, aims and model have been introduced, and the teachers were familiarized with six selected Earth and Universe Pupil Research Briefs (EUPRB), which were given as the practical basis of the IBSE approach. The chosen EUPRBs did match the German curricula regarding content and research focus. The teachers have been adapting these ideas to their own scenarios and their specific school conditions. They delivered student-focused lessons using the EUPRBs or complementing it. Using critical thinking and problem-solving skills, students at secondary level have been working within scientific scenarios they have been personally interested in. Their work has been published via posters and oral presentations that have been shared on the school site as well as on national “Express Yourself Conferences.” These annual conferences celebrated science and the work of the students. In this chapter, challenges, opportunities, activities, and results are reported. Before starting to describe the project implementation of Chain Reaction itself, it is necessary to explain the political background in Germany, since this considerably affected the whole realisation process. Germany consists of 16 federal states. Each federal state is autonomously responsible for its education and science policy. That makes nationwide and even sometimes regional innovation a challenge. Nevertheless, besides differences between the states, there are also commonalities. 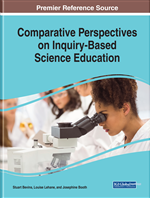 In the first part of this section, we will explain this rather complex background focussing on conditions for science teacher education at universities, teaching science at schools and for Inquiry Based Science Education (IBSE) in German classrooms. Despite the German federalism, a Standing Conference of the Ministers of Education and Cultural Affairs (KMK) of all German federal states was installed in 1948. The KMK is instrumental in the coordination and development of the country’s education. Its “…consortium of ministers is responsible for education and schooling, institutes of higher education, research, and cultural affairs, which formulates the joint interests and objectives of the 16 federal states” (Kultusminister Konferenz, 2017, para. 1). The KMK’s agenda is to address “educational, higher education, research, and cultural policy issues of superregional significance with the aim of forming a joint view and intention and of providing representation for common objectives” (Kultusminister Konferenz, 2017). Respectively, the Standing Conference of the 16 ministers regularly discusses the country’s issues in the field of education, implements expert groups for the development and assurance of common standards, and publishes recommendations to support the achievement of high national standards in education. The present standards for science education in German schools were published by the KMK in 2005. Looking at these standards, science education plays an important role in the field of secondary education in Germany. It is therefore provided nationwide with science offered disciplinarily in the form of biology, chemistry, physics, and geography. It parallels the form of more general- and inquiry-oriented interdisciplinary subjects, including science and technology at the secondary level. Preceding this practice, the children at the primary level are getting to know basic science phenomena around their everyday life and are becoming familiar with experimental activities. It is customary in Germany that all teachers at primary and secondary levels teach at least two subjects. They have or have yet to study these different subjects at university level, as well as pedagogy and education disciplines. These studies occur in two phases. For instance, two state exams (first at the university level and then at a state seminar) existed up until 2015 in the German state Baden-Württemberg, where the project was implemented. After 2015, mainly Bachelor’s and Master’s degrees are earned at the university. While German teachers (or student teachers) have to choose and combine two to three subjects, examples of combinations include for instance physics and sports, chemistry, and the German language, or biology and chemistry. Teacher training programmes are offered at Bachelor’s and Master’s levels during pre-service teacher education at German universities. Despite intense communication about the quality of education within professional networks of scientists, politicians, and science educators in this decentralised system, a strong heterogeneous picture is present in pre-service teacher education and inquiry. In the German state of Baden-Württemberg, for example, lower secondary teachers are educated at universities of education. These universities are more specialised in teacher education, including a large focus on pedagogy, didactics, methods of teaching, and in-school practical experiences. In contrast, common universities in Baden-Württemberg and their “gymnasium” (high school) teacher training programmes, aiming at the education of higher secondary teachers who will teach in this specific type of school called gymnasium, are much more focused on scientific content. As a result the majority of gymnasium students are prepared to proceed to at Universities. This logically results in an inhomogeneous picture concerning the individual qualification profile of German secondary teachers with respect to their teaching approaches.